Night Sounds #4: Lucky Dragons, 2014, New Canaan, CT. Image from a film by E. Lee Smith and Derrick Belcham. 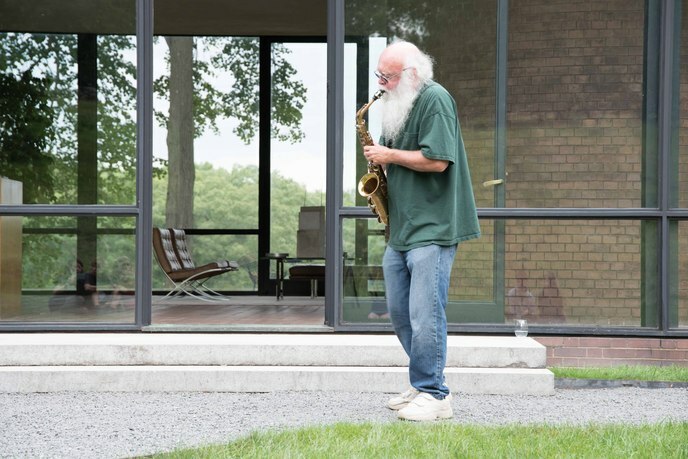 Night Sounds is a new performance series that parallels Night (1947–2015), a contemporary "sculpture-in-residence" project for the Philip Johnson Glass House that contends with the legacy of Alberto Giacometti's missing sculpture, Night. Each live on-site performance is paired with one of seven sculptures created through the Night (1947–2015) residency. The events will be documented by Derrick Belcham, who will produce a short film available online free of charge. 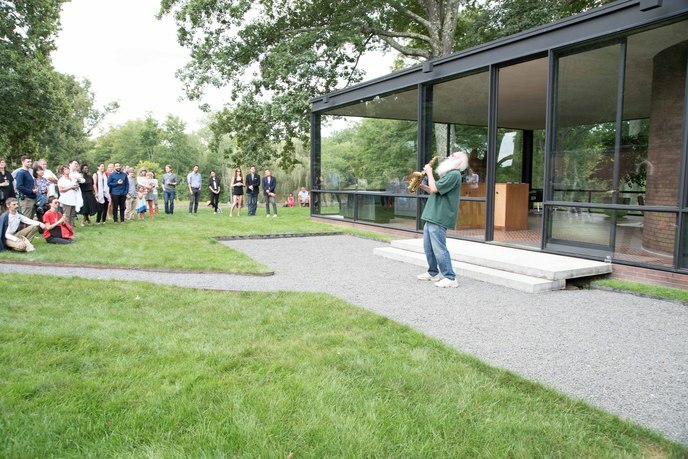 Night Sounds invites the attending audience and online viewers to reinterpret the Glass House while reflecting on the interplay of presence and absence on this historic site. 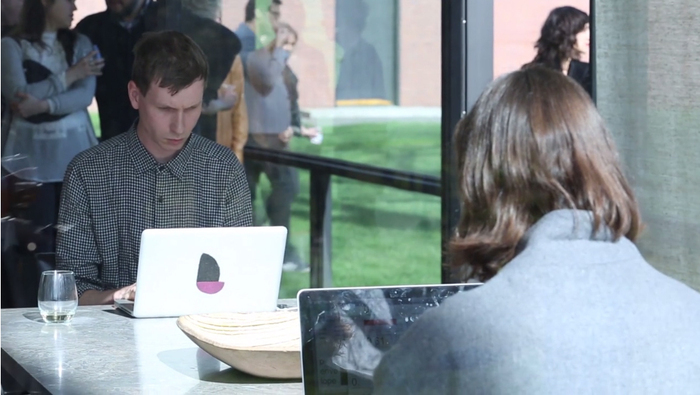 Jordan Stein is the program coordinator of Night Sounds and the guest curator of Night (1947–2015). He is a cofounder/director of Will Brown, an experimental exhibition and program space in San Francisco. Stein is also the founder of Glass, house, a project-based curatorial initiative that explores notions of transparency and reflectivity in contemporary art practice and presentation. With artists and nonartists, Glass, house publishes books, makes films, and releases records. 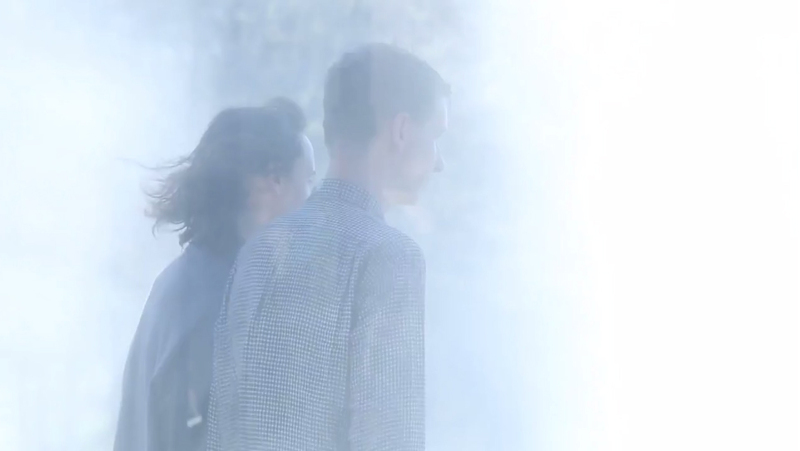 At the Exploratorium, a museum of human perception in San Francisco, he is currently developing projects with artists Harrell Fletcher, Lucky Dragons, and Fujiko Nakaya. Stein graduated with an MFA from the San Francisco Art Institute in 2005 and participated in the Curatorial Intensive Program, organized by Independent Curators International in 2010. He is a 2010 recipient of Southern Exposure's Alternative Exposure Award. Derrick Belcham is the videographer of Night Sounds. Based in Brooklyn, New York, Belcham is an internationally recognized Canadian filmmaker, known for his work in vérité music documentary. He has worked with artists such as Philip Glass, Thurston Moore, and Wilco. He is presently working on a series of dance films featuring acclaimed dancers of New York City performing choreography and improvisations in the streets of the city. The Glass House, a National Trust Historic Site, offers its forty-nine-acre campus as a catalyst for the preservation and interpretation of modern architecture, landscape, and art and as a canvas for inspiration and experimentation honoring the legacy of Philip Johnson (1906–2005) and David Whitney (1939–2005).